As the year 1915 began, Britain's political and military leaders were divided over how the First World War should be fought. The early optimism that it would be a short, sharp fight - "all over by Christmas" - had been quickly dispelled by the terrible casualties from the fighting in France and the stalemate of trench warfare. Some argued that only by defeating the principal enemy (i.e. Germany) in the principle theater (i.e. Western Europe), could the war ever be won. While history has proven this argument correct, for many the logic of continuing to send men to their deaths in the hundreds of thousands on the Western Front was anathema and they sought other options for a 'back door' into Germany. Among them was Winston Churchill, then First Lord of the Admiralty and a leading young light in government. He was eager to find a way in which the Royal Navy, traditionally Britain's strongest military service, could play a more decisive role. After clumsy British diplomacy Turkey had entered the war in October 1914. Churchill pressed for a naval attack to force the Dardanelles. He knew it was risky, but he gambled that if even only a few ships got through and shelled Constantinople it would topple the Turkish government and knock them out of the war. Lord Kitchener, Secretary of State for War (imagine any modern politician having such a title! ), disagreed; he believed every soldier killed in other 'side-shows' was a man wasted who could have been fighting the Germans. He was happy to let the Navy act alone, but begrudged Army manpower to accompany the expedition. Thus, in the words of historian Peter Hart, "from the beginning the campaign had all the hallmarks of a classic British military failure: unrealistic goals, a lack of any clear plan and an under resourced military force. Add a few incompetent local commanders and good dose of ludicrous overconfidence all round and the recipe was complete"
Sgt Thomas Worthington, 1/6th Manchesters. The campaign had a strong link to the city of Manchester, which sent seven battalions to the fight. 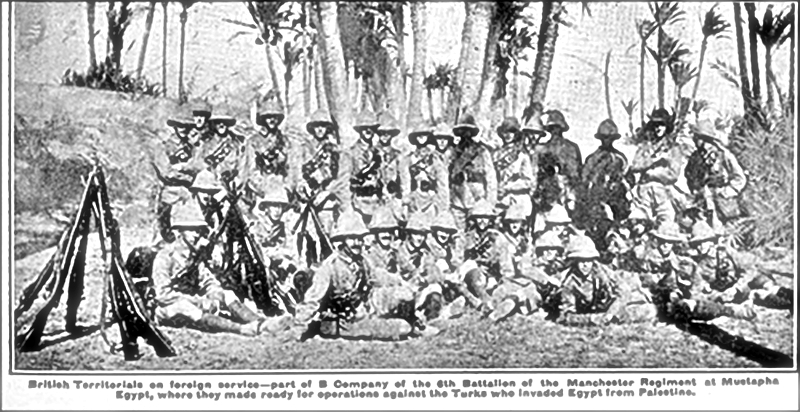 For example the 6th Battalion Manchester Regiment was a Territorial Army unit which deployed to Gallipoli in early May with a strength of 759 men. By September 91 had been killed, 375 wounded and 79 were missing, a total of 545 or a 72% casualty rate. Add to that those replacements who had arrived in the interval and also been killed or wounded and the total casualties figure is over 81%. This is typical. Such vignettes help us to appreciate the human loss when the casualty figures as a whole for the Gallipoli campaign are of a scale that is very difficult to really comprehend. Gallipoli cost 125,000 British and Indian dead and wounded, 33,600 Australians and New Zealanders and 27,000 French. The Turkish Army is believed to have lost 175,000 soldiers. That's over half a million men killed or wounded on a narrow peninsula in a campaign that lasted less than a year. And the remarkable thing is it really wasn't that long ago. There are literally thousands of people living in Britain today who were alive in 1915 when the fighting took place.